Let's have a brief conversation, Mr. Bieber, just you and I. Alright, I know that you really want to be a professional musician, and that's just fine. Y'know, we all have dreams. Why, my dream is to become a half-man, half-cow hybrid and take over Mauritania with my superbovine abilities. But that's a dream whose reality counterpart should not come to fruition because it's not particularly beneficial to anyone in particular, except for the scientific community, but they should focus on curing diseases, now making me a cowman. You, Mr. Bieber, you may want to consider the same philosophy when it comes to your music. I have nothing against you putting yourself out there and playing your little guitar there. That doesn't concern me at all. It's good that you found a hobby that does not involve live ammunition. We can all learn from that. In fact, it's wonderful that you have even come this far so early in life, even though it had to be through Usher. But because it's so early in your life, you may want to reconsider what you're singing about. Basically, before you start chanting away about real love and the like to a hip-hop beat, at least wait until your testicles drop first. 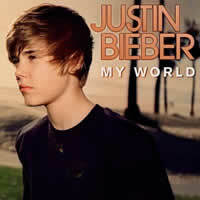 Let's look at the first song on your first little album, "My World". It's called One Time; contrary to what I expected, this is not a song about how many times you've been kissed by a girl in your lifetime. It's actually the number of times you are going to tell some girl that you will be their only love... which makes me wonder why this song is so long. The first time I heard this song, I thought it was being sung by a 7-year-old girl. But no, it was a pubescent fellow like yourself, Mr. Bieber. And what's with the hip-hop persona and background instrumentals you are fronting? You're from frickin' Stratford, Ontario. Watch out for those gang shootouts by the Shakespearean Stratford Festival! You have zero street credibility and probably grew up in a house with a white picket fence around it. I hate how all these boys are trying to look "fly", and end up looking more like they were all born at Roots and given the bowl haircut treatment. For shame, you! And Favorite Girl? Are you serious? How can you have a favourite girl at such a young age? You haven't had too many girlfriends so far, and if you have, I will admit that I am quite impressed by your dating agility. At least you're getting more into suitable musical territory here with mere pop. But it's not great, Justin. You could do much better. Also, did I hear you call the girl your "prized possession"? I'm sure girls love being called possessions. Why don't you do a follow-up song called "My Girlfriend, The Amazing Object"? Then, after that fiasco, you think a sad little ballad like Down To Earth is going to up the ante on your musical credibility? You sing as if you have tons of dating experience and that life is just so terrible for you because you're far away from your true love. You probably recorded this when you were 14. FOURTEEN. ONE-FOUR. When I was 14, I was frickin' scared of girls. I think the cootie fad was just passing. And Bigger? Why don't you wait until you're bigger to keep singing these songs? And this is a pretty lousy song anyway; it's poppy, that's for sure, but you're singing about being a "player" and a "heartbreaker" when you were little. But Justin, you need to acknowledge that you aren't any bigger yet? ...Is that 7-year-old girl still singing? Oh, that's you? My bad. I'm sorry to hurt your feelings, but I really can't go on with this album. You're just a bit too fake for me. Alright, let me take a deep breath and I'll keep going. Well, looky here -- you have another single! I'm impressed you made it this far without getting lynched by a mob of mature musicians. So the song is called One Less Lonely Girl. Oh, did you expect to give them your own company? I thought they'd be less lonely because someone with more experience was going to take care of them. But alright, I'll bite. How are you going to make a girl less lonely? By crooning to them? Oh, by entering their "world"? Couldn't you just buy them a Wii with all the money you've made off this album? That would make me happy. After our little chat, let's go to EB Games, shall we? Let's move on, shall we? First Dance is the next song... and holy hell, I'm sorry, but why did you collaborate with Usher for this? He's not going to add to your credibility. Plus, if you're hanging out with him, one of two things will happen: either he's going to steal all the women you're trying to lure, or the police are going to start asking questions. Oh yeah, and the song is lousy -- stop posing as an R&B maestro. But all it takes is one good song to turn around an album, so let's see what Love Me has to offer. Crap! It sounds like Lady Gaga got into your head... except you don't quite have her skills in the dance-pop department. Wait, I've heard this song before. But where? ...Crap again! You did a dance cover of "Lovefool" by The Cardigans? The original song got annoying quickly; why bring back painful memories of overplayed music on the radio? Dammit, Justin, way to end on a weird note. Wait, what's that? You say there's a bonus track on iTunes? Please, just quit the music industry until you get some more experience with the ladies and then possibly return. Or become a lathe operator. Both are good. ...Oh, alright, don't give me that puppy dog face. I'll listen, but only I don't have to be anywhere for another half an hour. What's it called? Common Denominator? Finally, a useful song. At least you're trying to teach others that math is important. Fractions are often difficult for many students. ...What? It's actually a ballad about the love between yourself and a girl? Boy, what a shocker. No, turn it off. I've heard enough. So what did you learn from our little conversation, Mr. Bieber? Did you learn about the errors of your ways, and how it is important to actually understand the exact nature of the content of your songs before you decide to venture into such lyrical territory? Did you learn that you should follow your own style and not adapt to what could be deemed as popular by the general crowd? Did you learn to wait until your voice gets deeper before you even think about singing about love again? Huh? You didn't learn anything, and you're going to continue on this path? Well then, I have nothing more to say to you, but just keep my words in the back of your mind. You never know when they will click. Good luck, Mr. Bieber.